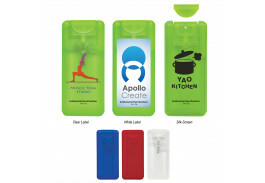 Personalized hand sanitizer is a cost effective way to get your name out and works with any promotion or event. 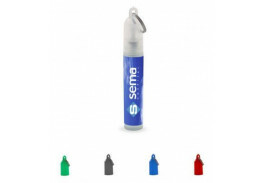 Perfect for tradeshows, health fairs and outdoor events, custom spray hand sanitizers are the most convenient way to clean your hands when soap and water are not available. 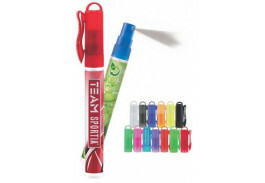 Our spray hand sanitizers come in several styles. In addition to the standard pen style with the clip on the cap, we also offer credit card sized sprays that will fit in any pocket or bag. 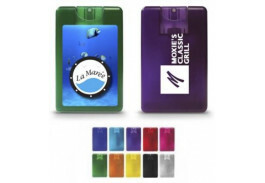 Customized hand sanitizers are used frequently by doctors, nurses and other health professionals, as well as teachers, parents and anyone with an active outdoor lifestyle. Our pricing begins at 56¢ per piece, and several come with the option of adding a carabiner for only a few cents more. Our .33 Oz. 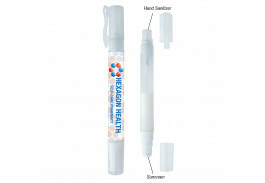 Hand Sanitizer Character Pocket Spray is ideal for pediatricians and children’s hospitals, police and fire fighters, teachers, or anyone else sponsoring a health related or children’s event. 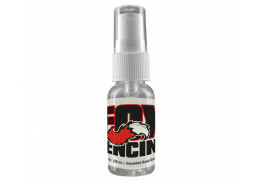 Not just for the office, custom imprinted hand sanitizers are great for sporting events, camping, mountain climbing and other outside sports where you may need a quick cleanup without a facility nearby. The portable size means you can take them anywhere and never have to worry about dirty hands. Aside from simple cleanliness, hand sanitizer helps prevent the spread of bacteria and other germs associated with colds, viruses and the flu. Stock up today and order bulk hand sanitizer online for your next event!